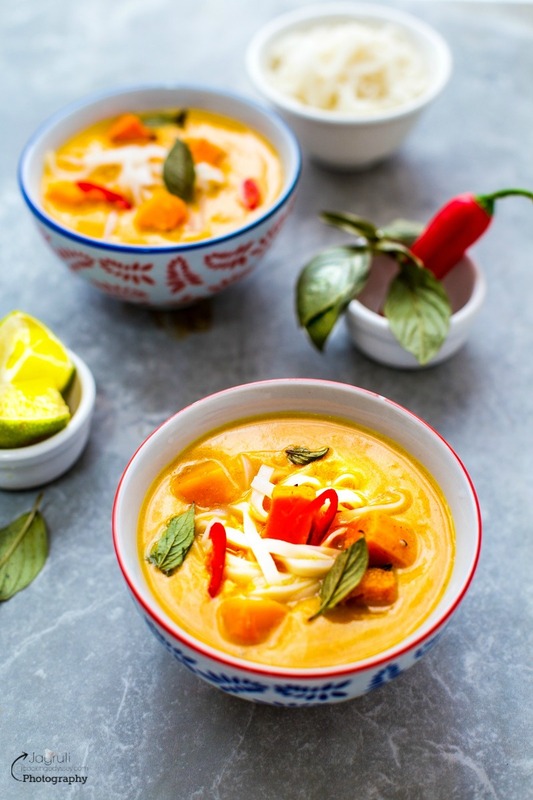 Thai style Squash and Sweet Potato Noodle Soup, easy and truly soul-warming and satisfying one that is good for the body and soul!!! This soup has a depth of flavour, warm and punchy with fragrant spices, and mellowed down with rich coconut milk. This soup is superb on its own but also great with crusty bread or rolls too. Nothing is more comforting than a bowl of warm soup in your hands once the weather starts getting cooler day by day, and the other most comforting thing is when your soup is made from scratch and every spoonful soup becomes blissful for you, soup gives you almost immediate gratification ! We make and enjoy a couple of types of new soup with new flavours every season, but soups made with Squash always remains the top choice for everyone in the family. Winter squash adds a bulkiness to the soup and makes the soup more filling. 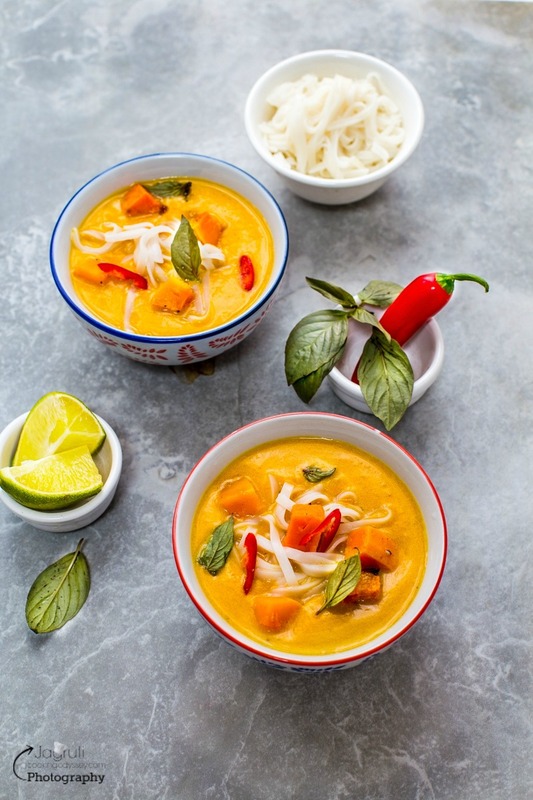 Thai Style Squash and Sweet Potato Noodle Soup is a new avatar of Thai Style Squash Soup, a couple of new ingredients made an entry in this soup such as Red Thai Curry Paste, Fresh lemon grass and Noodles. Pre-heat the oven to gas mark 7. Place squash and sweet potato chunks on the baking tray. drizzle some oil , salt and pepper. Roast until done, it will take about 20-25 minutes. Meanwhile, cook rice noodles according to packet instructions. Heat oil in another pan, add curry paste and fry for a couple of minutes. Add coconut milk and vegetable stock and soy sauce. Add to the simmering soup and cook a further minute or so. Then add the lime juice. 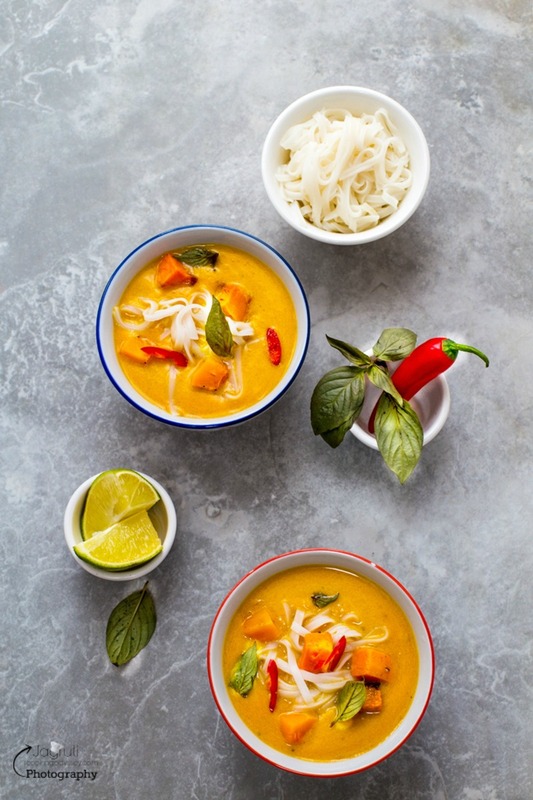 Divide the cooked rice noodles between the serving bowls, ladle over the soup and garnish it with the roasted squash and Thai basil leaves and red chillies. That is gorgeous. I just made up a batch of Thai red curry paste. This seasonal soup is on the menu soon. This sounds so lovely, I'm so glad it's the end of Summer so I can enjoy food like this it's my favourite! This soup looks like it has all of my favorite things in it. Can't wait to try! Yum! This looks so healthy and comforting. Yum. This soup looks fabulous!! It's so pretty and flavorful! I can't wait to make it. My hubby is going to be so happy once I do. 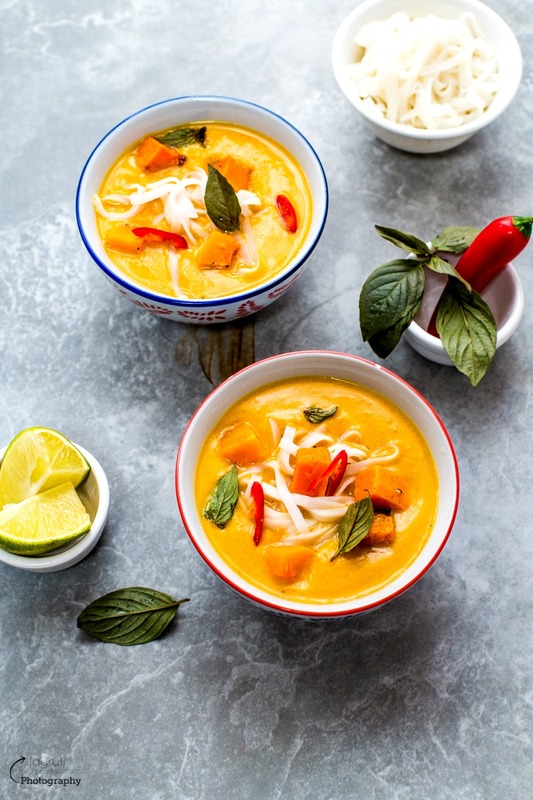 I love Thai flavors so this soup is a must try for me. I will be making it soon especially that winter squashes are coming to the stores. Some great flavours here! I love the sweet potato and butternut squash - this is a must try! I am Drooling at the color of the curry. I love Thai Flavors. This must taste so good. Looks so good, amazing flavors and clicks are just wow! These colors are fabulous! I love winter squash. I'm really trying to transition away from refined grains and only use whole grains though. This looks delicious. Perfect for the cooler weather.